Dr. Kelly Benoit-Bird received her B.S from Brown University and her Ph.D. from the University of Hawaii before completing a post-doctoral fellowship at the Hawaii Institute of Marine Biology. She examines a wide range of animals including zooplankton, fish, squid, and marine mammals using active acoustics (sonar) to understand the role of spatial heterogeneity (patches) and temporal patterns in pelagic marine ecosystems. She is particularly interested in the role of animal behavior in the formation of patches in the ocean and the effects of behavior like schooling, cooperation, and other ‘group’ processes on inter-individual and predator-prey interactions. In order to address complex, four-dimensional problems she often develops new acoustic techniques and integrates these tools with other approaches including optical sampling, animal tagging, and behavioral modeling, typically as part of interdisciplinary research programs. In 2010, Kelly was awarded a MacArthur Fellowship, commonly referred as a “genius award” for her “exceptional creativity and promise for important future advances based on a track record of significant accomplishment”. 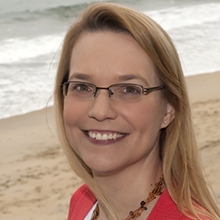 Her work has also been recognized by the Acoustical Society of America with the 2009 R. Bruce Lindsay Award for “contributions to marine ecological acoustics” and the American Geophysical Union which awarded her the 2008 Ocean Sciences Early Career Award for “innovative application of acoustical techniques”. Kelly is also the recipient of a United States Presidential Early Career Award for Scientists and Engineers, a Young Investigator Award from the U.S. Office of Naval Research, and a U.S. National Academy of Sciences Kavli Frontiers Fellowship.